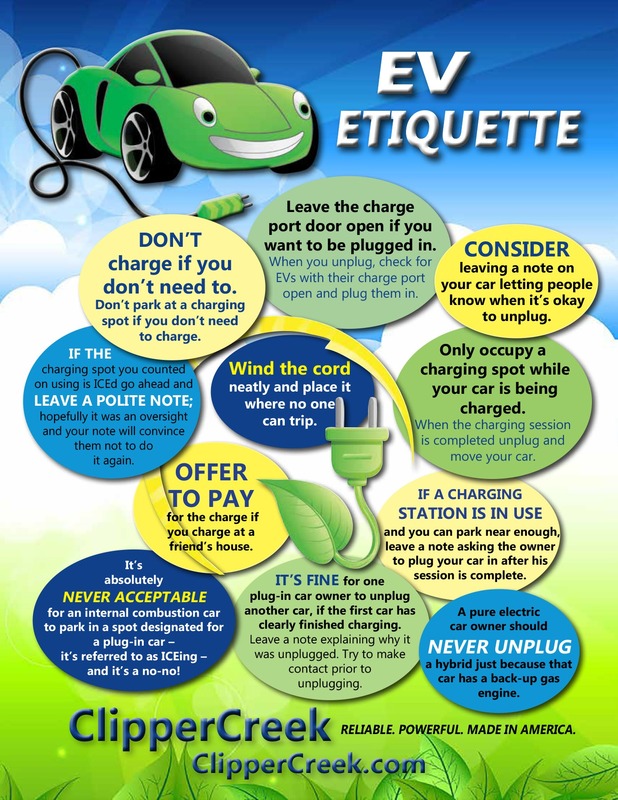 Here are some of the best charging etiquette ideas for electric vehicle drivers compiled from ClipperCreek customers and fans. 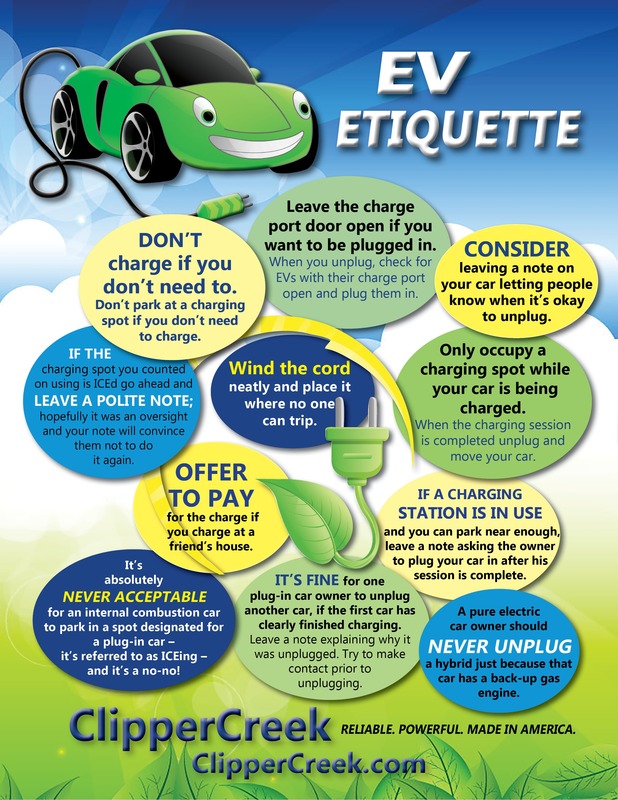 You can also download of this graphic EV Etiquette. Consider leaving a note on your car letting people know when it’s okay to unplug. Wind the cord neatly and place it where no one can trip. Don’t charge if you don’t need to. Don’t park at a charging spot if you don’t need to charge. Leave the charge port door open if you want to be plugged in. When you unplug, check for EVs with their charge port open and plug them in. Only occupy a charging spot while your car is being charged. When the charging session is completed, unplug and move your car. 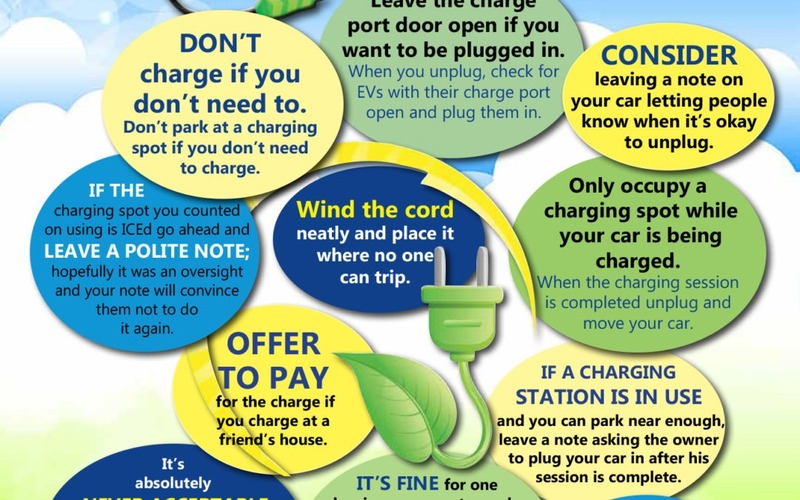 If a charging station is in use, and you can park near enough, leave a note on the owner’s vehicle asking them to plug your car in when their session is complete. A pure electric car owner should never unplug a hybrid just because that car has a back up gas engine. Offer to pay for the charge if you charge at a friend’s house. This is proper etiquette and it’s also a great conversation starter. Your friend will probably be surprised at how little it costs to charge compared to fuel. If the charging spot you counted on using is ICE’d go ahead and leave a polite note; hopefully it was an oversight and your note will convince them not to do it again. It’s absolutely never acceptable for an internal combustion car to park in a spot designated for an electric vehicle. It’s referred to as ICE-ing and it’s a big no-no! It’s fine for one plug-in vehicle owner to unplug another, if the first car has clearly finished charging. Leave a note explaining why it was unplugged. Try to make contact prior to unplugging. If you have additional etiquette ideas, email them to press@clippercreek.net for possible inclusion in future versions. Is it acceptable for non-Tesla EV cars to use the Tesla charger (not supercharger) in public EV Charging stations? Tesla utilizes a proprietary vehicle connection interface, so standard Tesla charging stations can only be plugged into Tesla vehicles. Tesla does provide an adapter with their vehicle so Tesla vehicles can use the standard J1772 EV charging connector.